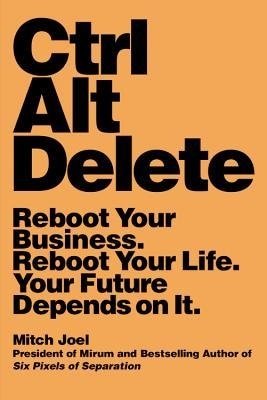 “Ctrl Alt Delete: Reboot Your Business, Reboot Your Life” by Mitch Joel (Grand Central Publishing, $18). There’s a huge difference between an entrepreneur and a business owner. The entrepreneur always focuses on creating the future — “someone who sees inefficiencies in the work we’re doing” — and wants to fill gaps and break trail. Joel points out that entrepreneurs don’t always mean small business. The culture of an organization creates internal entrepreneurs (i.e. intrapreneurs) by perpetually focusing on what’s next. He cites Apple as an example; two-thirds of its revenues come from products invented since 2007. Google is another; it has an initiative where employees spend 20 percent of their time on their pet projects. Employees at both companies spend long hours at work because “making a difference” drives them. Work isn’t really work; it’s simply what they were meant to do. While his family was napping, he worked on this book; when they woke, they headed to the park; dinner and bath time followed; then he wrote some more. Blending is about making time for what’s important at the time. 1. Mindshift: Evaluate the work you do in the context of what you were meant to do. If you’re not “doing what you are,” you just have a job. 2. Create action: It’s harder to become an activist than a slacktivist. You must push yourself to do what others talk about doing. No one makes a difference by commenting and criticizing. 3. Create provocation: Advocate change as opportunity. This involves both doing different things and doing things differently. The operative word is doing. 4. Play (on and with the job): Think tinker. Ask yourself what else could be done. When you tinker, you excite yourself and others by bouncing ideas — and figuring out what it takes to implement them. Key takeaway: “Embracing the next” requires critical thinking. 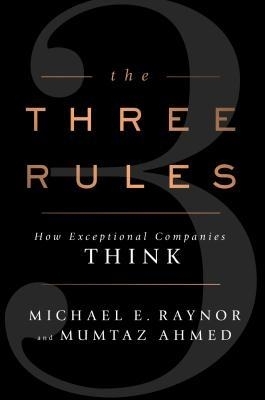 “The Three Rules – How Exceptional Companies Think” by Michael E. Raynor and Mumtaz Ahmed (Portfolio/Penguin, $29.95). 1. Better before cheaper – Non-price value is THE competitive differentiator. Every time you compete on price, you have to squeeze your resources. Over the long run, strapped resources make it difficult to offer and maintain quality, quantity and solutions. 2. Revenue before cost – You can increase profitability by increasing revenue and/or decreasing costs. The laws of operating leverage and diminishing return comes into play with reduced cost. There’s only so much you can do to reduce costs and maintain quality and innovation without sacrificing price and non-price value. On the other hand, increased revenue boosts profit margins. Always has, always will. 3. There are no other rules – Competition, fickle consumers and technology will always disrupt business strategy. When it comes to adjusting strategy, everything — except for compromising on the first two rules — is up for grabs. The bottom line: “The only certainty for any company doing well is that it will eventually be doing worse.” By adhering to the three rules, eventually may be a long-time coming. Jim Pawlak is a nationally syndicated reviewer of books.